In the last blog post, we lacquered the neck on our vintage Hofner Colorama II guitar. Today we will paint the body. 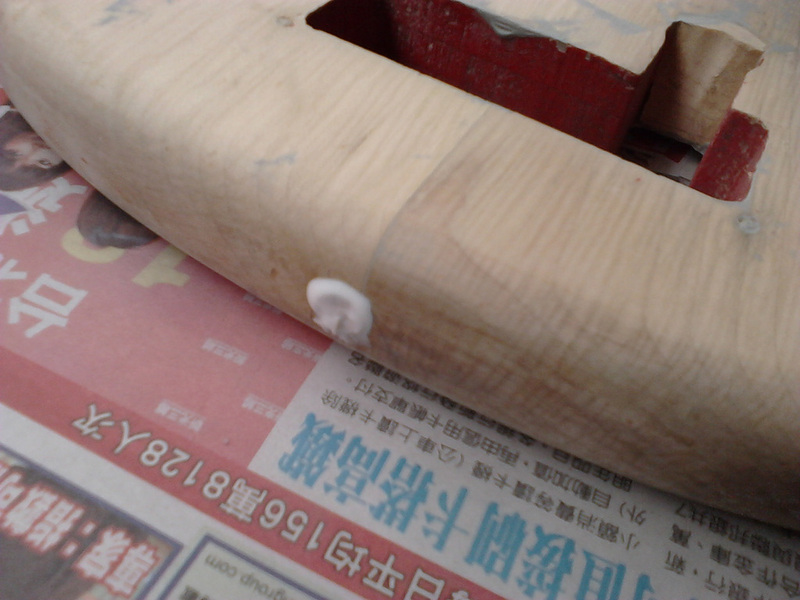 Before painting, we do a last check for anything we may have missed, like scrapes or gouges in the wood. This leads us to discover that the raw plug/screw anchor that someone had inserted to hold on the rear strap button, and which we were just going to leave, is, in fact, just half a raw plug. Now on with the show. A quick mounting system needs to be fabricated, so we cut a piece of wood that can be attached to the neck pocket. We drill a hole in it too, so that we can hang it up. We’ll also put a screw in the rear strap button hole to give us another contact point to move the guitar body around while we’re spraying it. 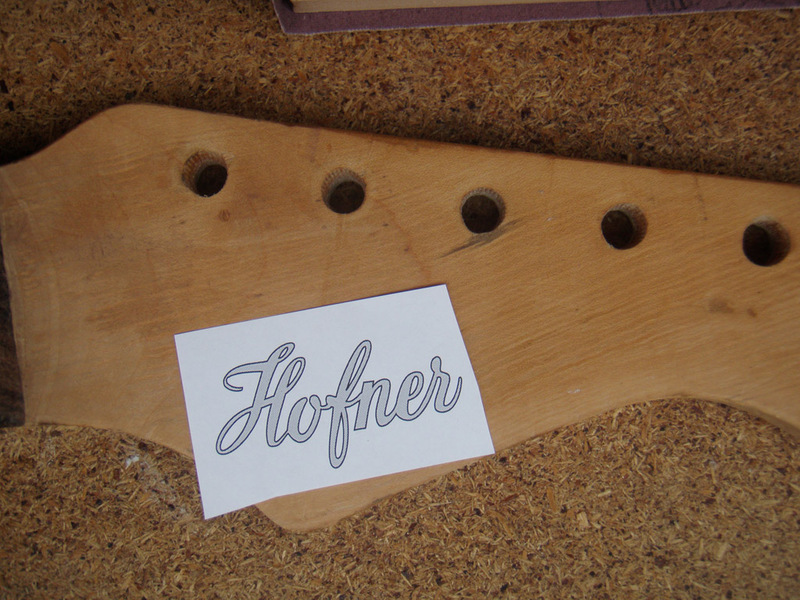 In the previous post, we set about making a replacement decal for the neck on this vintage Hofner Colorama II. 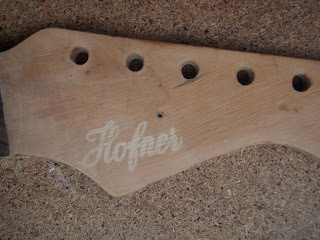 Before we lacquer the neck, we need to apply the decal. The decal is printed on special laser waterslide decal paper. This paper just prints on a standard laser printer. It’s also possible to get inkjet waterslide decal paper, but just note that an inkjet printout requires that you spray a layer of lacquer over the printed decal before you let it anywhere near water. So first we put some not-too-hot/not-too-cold water in a little dish and place the decal in there, making sure to submerge it. After a minute or so you will notice that it starts to separate from the paper. You can test this by seeing if it will slide around on the paper, but don’t force it too much. While we are waiting for the decal to reach this separation stage, it’s a good idea to spread just a little bit of water on the area where we will apply the decal. This helps to prep the surface for what is to come. Once we know it is ready, we slide the decal off the paper directly onto the peghead (i.e. don’t slide it off in the water and then try to pick up just the decal without the backing paper, as it will tend to fold over on itself). As long as the decal is wet, we have time to move it around to put it in just the right place. You can even add a bit of water if it is starting to dry up but is still not in the right place. That said, try not to end up with too much water on the peg head, as you will need to wait for this to dry before proceeding. After the decal is located in the correct area, take a dry tissue or similar and gently press down on the decal to make sure it is flat, bubbles are removed and the edges aren’t curled up. This also helps to remove some of the water, shortening our waiting time for the next step (lacquering). Since this particular neck is maple with a rosewood fretboard, and since we do not want to lacquer the fretboard, we need to mask it off. Here I’m using thin masking tape to do this. I give the whole neck a quick wipe down with water and let it dry before the next step. This helps to remove any last-minute dust and also preps the surface somewhat to accept the lacquer. It is common to hang up a neck before lacquering it, but I prefer to lay it flat on its back, lacquer the front of the peghead, and then turn it over and lacquer the back. I put about five layers of lacquer on each side and then hang it up to dry. After maybe an hour, when the lacquer has had enough time to dry out just a little, but still has some softness to it, I carefully remove the masking tape, being very careful not to touch the rest of the neck. The neck will hang here for several weeks before getting a final sanding and polishing. 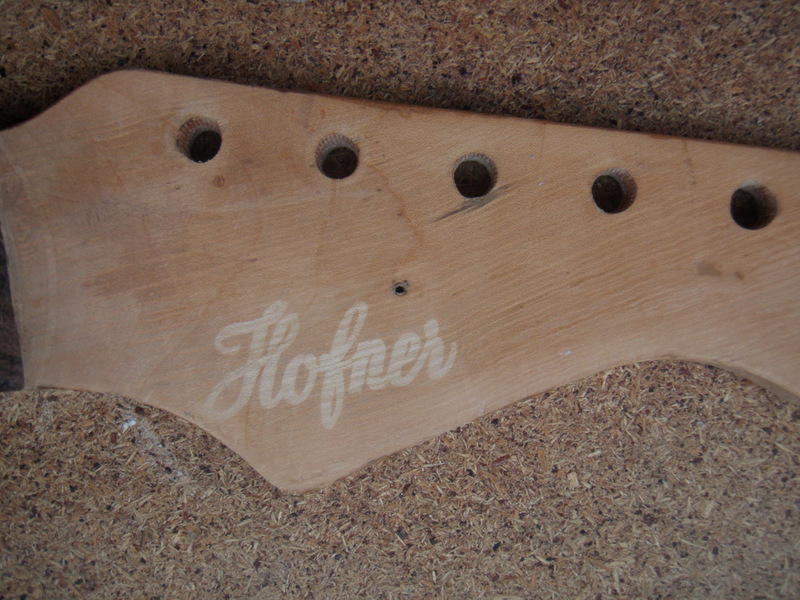 Before lacquering the neck on our vintage Hofner Colorama II, we need to deal with the “Hofner” waterslide decal and the serial number stamped on the back of the headstock. Here’s what the serial number looked like before stripping the lacquer. The “8” is hardly visible (although to be honest, it wasn’t stamped very deeply to start with), and in fact all of the numbers are in danger of becoming almost invisible once we add a few layers of lacquer. As it happens, I have a set of number punches, but they are a different size from the ones used on this guitar, which leaves us with two choices: sand the numbers off completely and re-stamp them, or try to repair what we already have. I’ve decided to go for the second option, since I feel a little weird about re-stamping serial numbers. Nevertheless I’m pretty happy with the results, and a few layers of lacquer should help smooth it out somewhat anyway. 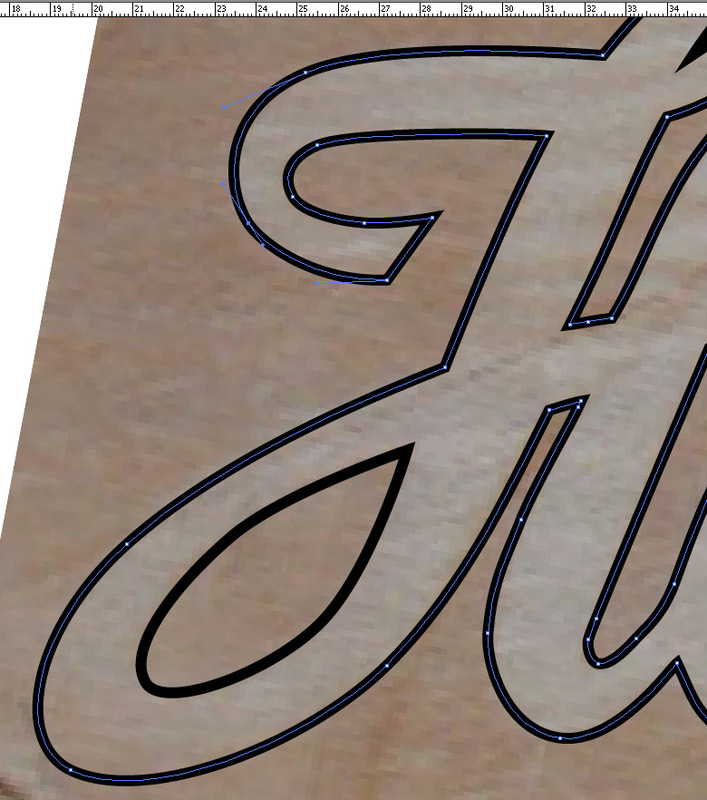 Originally the plan was to find an image of a standard Hofner logo online and trace around (I use Adobe Illustrator to do this). That really did seem like a good plan, and the results were more than acceptable. 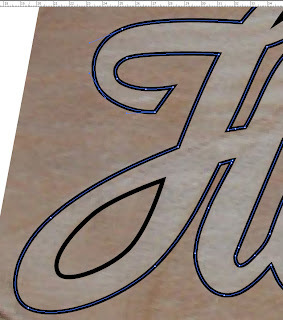 At first glance it looked like the logo we traced would fit well, but upon further inspection it became apparent that the tan line would be very obvious in certain areas, so it was back to the drawing board. A photo of the peghead was taken, along with a photo taken at exactly the same angle of a printout of our first attempt sitting in more or less the same place. Both images were then brought into Illustrator, and resized by the same amount so that the photo of our first attempt matched up perfectly with our Illustrator tracing. The tracing was then moved down to the photo of the tan line and the edges were adjusted to match these as perfectly as possible. You may notice that it’s a slightly different colour from our first attempt. This is because after printing out the first version, it became apparent that it was going to be too light. In the last post (http://diystrat.blogspot.com/2011/11/hofner-colorama-ii-restoration-project.html), we stripped down and scraped the paint off the body of our vintage Hofner Colorama II guitar. Before we even consider repainting it, there are quite a few issues that need our attention. These are mentioned in the previous post, so if you haven’t already read it, please feel free to do so now. So first of all, we put the cover back on and mark the edge of it. This will give us an indication of what will still be hidden under the cover once the guitar is finished, and gives us some freedom to have a less-than-perfect finish underneath. The straight line being drawn here also shows us how far back we can build up the wood without it starting to interfere with the tremolo mechanism. Once we’ve marked the limits, it’s time to remove some additional wood. 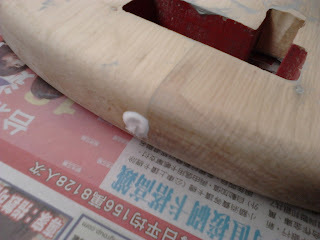 This stops the join from being right where the screw hole will be, which would weaken the repair somewhat. Once we’ve removed a suitable amount of wood, we shape a replacement piece of wood to fit in the gap. 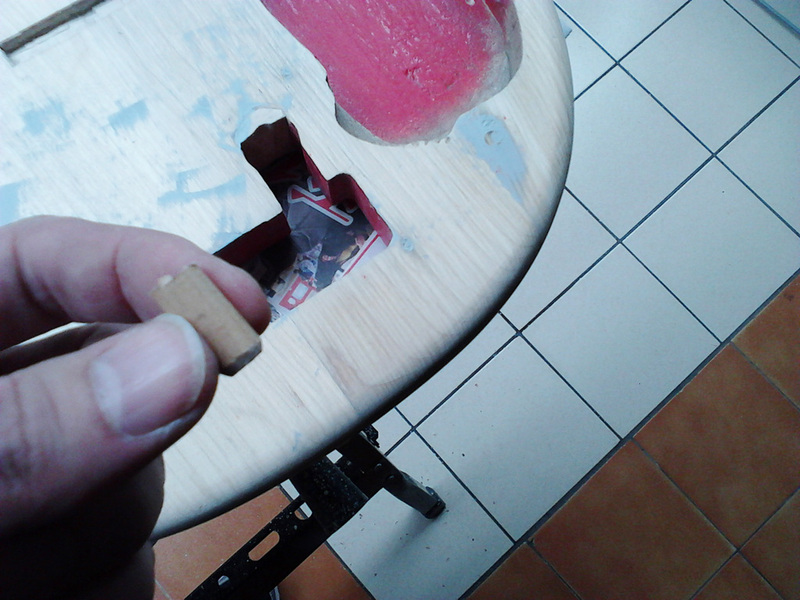 Finally, we glue the replacement wood in place, as shown here (the hammer is just used as a wedge to hold it in place while the glue dries). The next issue is that of the indentations cased by the pickup pole piece screws. These stick right out the back of the pickups and are actually causing the pickguard to rise up off the surface of the guitar and warp. I’ve decided to cut a little trough for each set of pickup screws to alleviate this. Since this is a hidden mod, I’m not too concerned about how it might look. Marking out the edges of the trough. Using a fine chisel to cut one of the troughs. We also have a couple of broken screws to deal with. The best option here is to make a tool to bore a hole AROUND the broken screw. This is a simple matter of finding a piece of metal tubing about the right size and filing some teeth into it with a needle file. We then fit the metal tube to a drill and drill a hole around the screw, as shown here. Note that it is extremely easy for this to skip across the guitar body while you are trying to drill, so take great care here, and if possible use a variable-speed drill set on very slow. 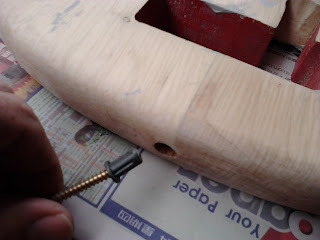 To avoid the skipping problem, you can either use a drill press, or if that's not an option, drill a hole through a scrap piece of wood first that's the same size as the outer diameter of your boring tool, then clamp that to the top of the guitar so that the hole is right above the screw you want to drill out. Now drill down through that hole with your boring tool. 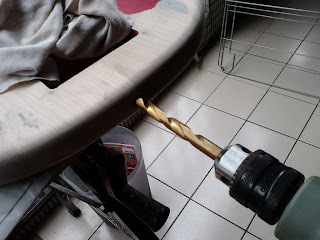 Now we’re left with quite a mess of missing wood, so the easiest option is to drill a normal hole that can then be filled with a piece of wood of the same diameter. 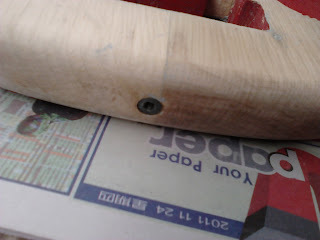 Here is the drilled hole, with our wooden rod of the same diameter. You may remember we had one more issue with a screw hole too close to an edge. This was located at the bottom edge of the control cavity (under the pickguard). This one isn’t as bad as the one under the tremolo cover, so we are going to simply drill this out and plug it with some more of our wooden rod. The screw holes that were used to secure the tremolo to the back of the guitar are so big now that I’ve had to plug them with kebab sticks instead of cocktail sticks. Finally we’re in a position to start filling any imperfections in the surface of the guitar for which we will apply some car filler (e.g. Bondo). Simply apply this to any areas with imperfections. We repeat this process for the other face of the guitar (and don’t forget the sides). After repeating this process several times, we are more or less ready to think about painting the guitar.